It's been a busy week on this blog! If you missed all the giveaways to celebrate 100 Handmade Mondays, you can find them by scrolling down while you're on the home page. There's a giveaway a day for five days - and it's not too late to enter them all! The lucky winners will be picked on Thursday and Friday, so look out for an announcement. I'll try to email each winner, but do pop back here in case I can't contact you. I'd like to say a very big thank you to all the entrants - I wish I had enough prizes for all of you! 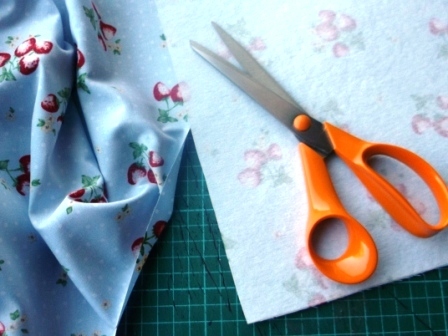 Apart from giveaways this week, I've been busy turning my lovely strawberry fabric from Abakhan into a picnic blanket carrier for Craftseller magazine - the kind of thing that wraps around a rolled blanket and has a handle to go over your shoulder. I told you I was thinking summer picnics! Picnic weather would make a lovely change from snow, slush, sleet and hailstones right now. To be fair, the sun has made a very welcome appearance this afternoon in Cheshire, but it's quite a long way from picnic weather ... the snow has melted and the garden is flooded, yet again! I'm just amazed we still have grass. If you want to make your own picnic blanket holder, you'll find the instructions in Craftseller issue 23 if all goes to plan. Meanwhile, I'll be writing up the pattern and instructions this week! I couldn't resist adding a felt strawberry on the pocket! It doubles up as a fastener, with Velcro on the back. What have you been up to? Leave your blog link below, then put your feet up to enjoy some blog surfing from the cosiness of your own home - the best place to be on a winter evening! Love that strawberry - looks good enough to eat! Not picnic weather here either, but I thought the fields were looking really clean & green after the snow had melted and given all the grass a good soaking. It'll soon be strawberry-picking time again. There's nothing more summery than strawberries! I love the fabric and the felt strawberry too. Can't wait to see the finished blanket carrier. The felt strawberry is so cute. I will check that out, as my picnic blanket has a very unsatisfactory strap contraption which is really fiddly to get the blanket in. Liking the look of the strawberry. Summer seems a long way still, but hopefully we will have a hot one where we can have picnics. Yes to hot weather and picnics - we have waited too long haven't we? 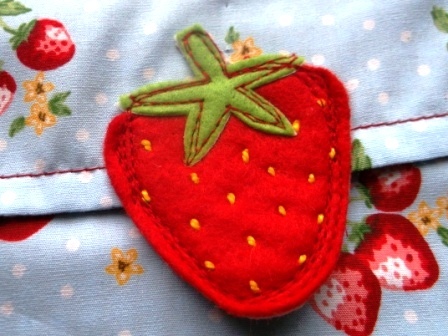 That strawberry looks lush and the fabric is a perfect accompaniment to a summer picnic. Thanks for the wonderful giveaways. Your strawberry looks good enough to eat. Stay dry. Another interesting project you are working on! Good way to cheer up the cold windy weather by planning for the summer. Lovely fabric for it too! So many pretty projects. Thanks for hosting.